High-end facilities chalk full of education technology are table stakes for prospective students and faculty at the nation’s best business schools. That’s why administrators at the University of California, Berkeley’s Haas School of Business pulled out all the stops when they had TEECOM design the $60 million Connie and Kevin Chou Hall. Opened in the fall of 2017, the new six-story educational facility packs eight tiered classrooms, 31 breakout rooms, a café and an event space into its 80,000-square feet. 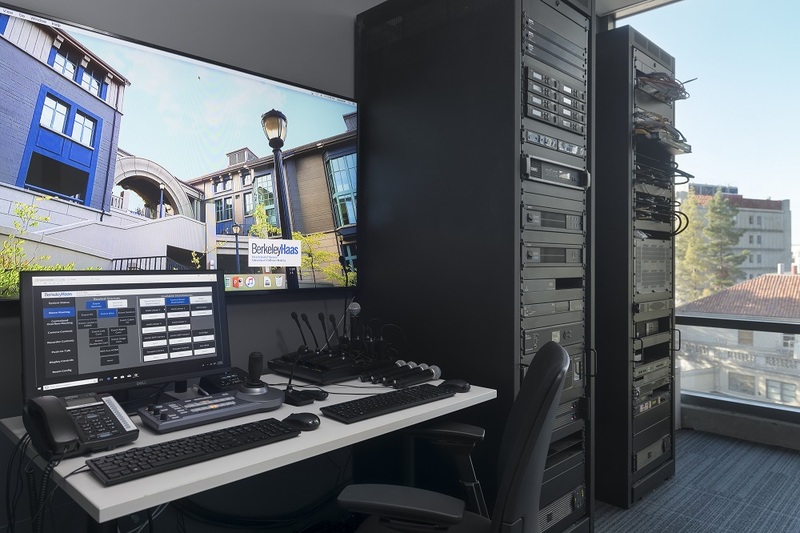 Meanwhile, the building’s gleaming modern design hints at the hybrid broadcast & education technology and AV systems packed within, designed by Oakland, Calif.-based TEECOM and installation by ICS Integrated Communications Systems. “[W]e created one unified system for the entire building,” says Josh Srago, design engineer for TEECOM. 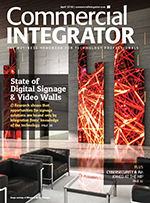 “We have [an Evertz MMG] 10-gigabit fiber video distribution that allows any video signal to go anywhere. We have a fully networked audio system that allows any signal to go theoretically anywhere. New LG displays and speakers from Tannoy and Terra throughout all classrooms output content that can be streamed remotely from room to room, while individual presets and automated lecture capture technology enables seamless recordings for students to revisit at will. 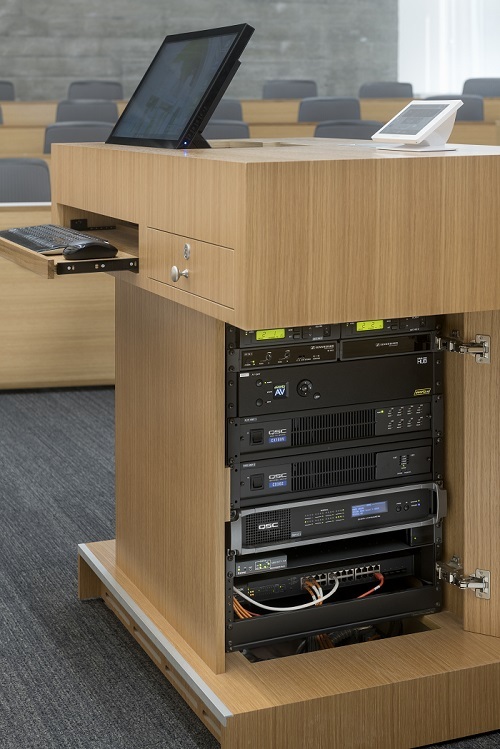 All of this networking and automation is routed through three new AV rooms, yet network managers can just as easily manage these systems via the customized Crestron control system, which was programming by PepperDash, while strolling the halls with tablets in hand. 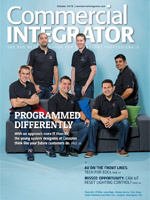 The end result is a more collaborative, flexible learning environment that caters to today’s students while appealing to tomorrow’s – no small benefit for a school that has doubled its enrollment in the last 20 years, with currently over 2,300 undergraduate and graduate attendees across seven degree tracks. Improving the in-classroom experience for both lecturers and students was a top priority, says Tom Tripp, AV Classroom Technology Lead at the Haas School of Business. “That’s why we went with three high-definition [Panasonic] laser projectors in each of our tiered rooms and at least a monitor and projector in all of our flat flexible rooms,” Tripp says. 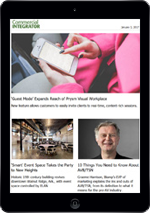 Now, Haas School of Business lecturers can establish personalized settings that they can utilize anywhere they teach, letting them use as much or as little technology as they choose, Srago says. 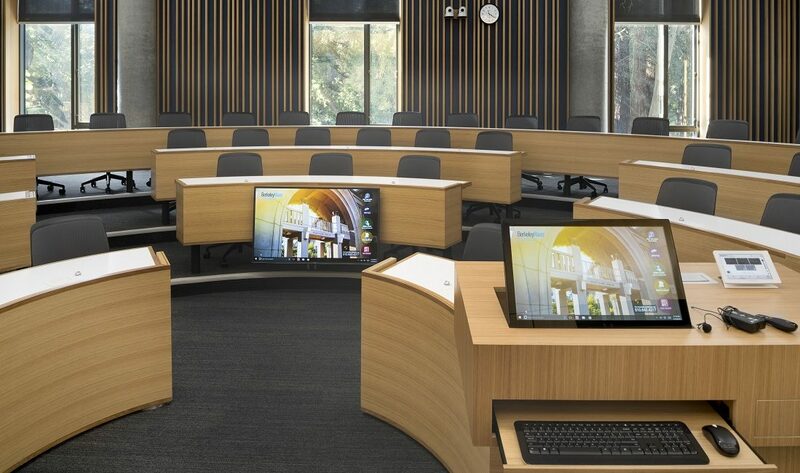 Instructors have the three Panasonic projectors at their disposal, as well as a confidence monitor and multiple inputs, which include a document camera, a laptop input, an in-room PC, and the Mersive wireless presentation solution. Or, they can bypass a video input raise one of the projection screens to draw on one of the whiteboards on the wall. There’s a touchscreen monitor on the teaching station, but they can use a keyboard and mouse if they prefer. “They can use the room in whatever way best suits their teaching methodology, which then makes them more comfortable and allows them to interact better with the students,” Srago says. Just as important to Haas officials as that experience in each Haas School of Business classroom and lecture hall was creating high-quality lecture capture, which is especially useful to grad students, says Tripp. “Our MBAs – particularly our evening/weekend MBAs and our executive MBAs – they’re already full time employed, and so they have a need to miss classes and we allow them to have a certain amount of absences and to accommodate that, we do the highest quality recordings we can of those classes that they miss,” he says. Each of the eight lecture halls utilizes Optex Rescan laser fields to track the instructor in the teaching well at the front of the room. “If they walk to one of the three whiteboards or into the front of the well or at the lectern, that zone is triggered and between the two cameras that are at the rear of the room, they alternate turns, switching between those shots for our encoding and the recording. “So, by doing that, we don’t have to operate and we don’t track the speaker, we actually just move it from a series of presets so it’s a little bit less jarring and the camera motion is minimized,” Tripp says. And the automated lecture capture also includes participation from Haas School of Business students. Push-to-talk Clock microphones trigger audio recording as well as the automated camera system, which then zooms in on a six- to seven-student area around that microphone, adding their image to the video capture. The microphones’ audio is then converted to Dante under the desks and run back to the teaching station, where it’s converted to QLAN and sent to the corresponding control room via redundant network connections. “This has been particularly great for when we have remote panelists, because part of the experience that we’re trying to give our students is that they have face time with CEOs, top executives and experts from around the world and previously, they’d have [only] voice time, with someone,” Tripp says. 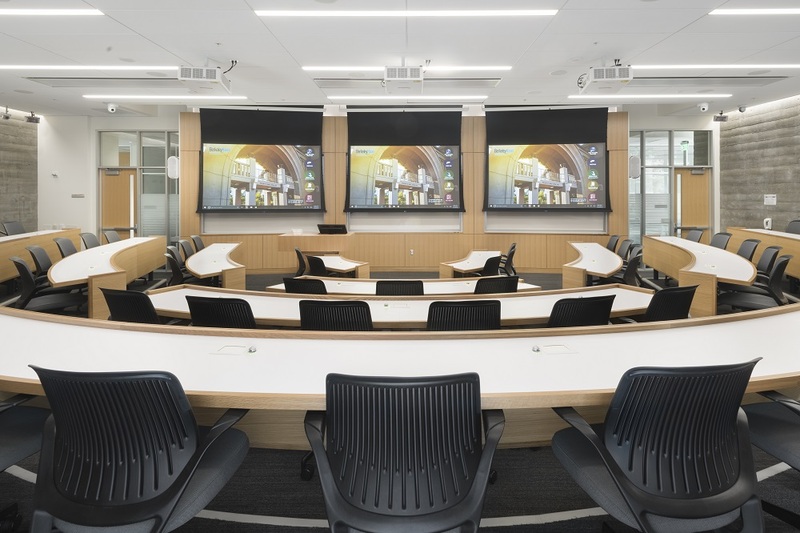 All of the education technology in the Haas School of Business’ new hall is controlled through a single system. All of this education technology is designed to be both fail-safe and flexible for future improvement. Since there was a seven-year gap between the design of Chou Hall’s physical infrastructure and its construction, the cable conduits were only so large. TEECOM worked to move as many signals as possible while pulling as few cables as possible. “That way, we had the potential for future expansion,” says Srago. Also, redundant core processors in each AV room ensure that if one goes down, students won’t be left wondering what their precious tuition dollars were spent on, Srago says. The crown jewel of the Haas School of Business Connie and Kevin Chou Hall is the 300-person sixth-floor café and event space, where a 20’x 9’ video wall 2.5mm LED Video Wall from PrimeView, driven by an RGB Spectrum MediaWall V, dominates the space’s north wall. To the east, the practice field and football stadium for the Cal Bears is visible through a wall of windows; to the west, through another bank of visitors and over treetops, sits the San Francisco skyline. “That event space was designed specifically for these larger events, for these banquets, for these fundraising opportunities and as a place to really provide an education in seminars,” says Srago. The end result of this project is a more flexible and collaborative learning environment, made possible by close collaboration between Haas planners and TEECOM. “The conversations early on, really understanding what the intended outcome is, especially for something that the Haas School of Business hadn’t built before… I think, is what got us to where we are today and really having a successful education technology system,” Tripp says.